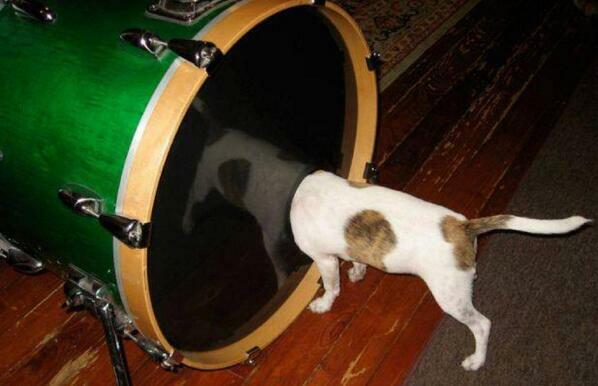 A kick drum is a kick drum, right? One is surely like the other. Well, no. Stating it that simply would not be true around these parts of the planet. Because you can have a big kick sound or a small one, a sharp or a dull one, a thin or a full one, etc. But is that the only thing about KDs, and otherwise they are easy as pie to mix? No, that’s not exactly the case either. Because the bass drum is always related to the bass, if there’s a bass track present, and there usually is. So while usually the kick drum is the lowest element of a mix frequency wise (let’s forget about the sub-bass stuff now), you can actually place the KD above the bass, which is usually the case in mainstream jazz and modern metal. You know, the latter is the kind that’s got smitten by the cookie monster. Poor guy. Anyway, you shouldn’t get freaked out by the bass drum, because it’s a percussive element, while the bass is a sustaining one, at least most of the time. So even if you have them cover the exact same frequency range and let them out at the exact same level, there’s still a thick chance that the kick will be audible, because its peaks will cut through the steady bass. Especially if your arrangement placed them out of each others’ way. Which is when it usually starts rocking nicely without much hassle. Now if you want something with a serious “knock”, i.e. when the 200 – 400Hz range has left more or less untouched, the next tune will serve as a good example. It’s kind of a signature sound of the 70s. And if you’ve thought enormous whale heartbeat BD sounds can only exist in modern R&B and electronic music, you’ll have to take a listen to the following tune (kick enters at 1:14 into the song). The kick drum is tuned nicely though, to the fifth of the key of the song. So why was the 80s so awesome? Because you could get away with reasonably light and peaky kick beats. Ones that enhanced the hip, tight sound this decade was so famous for. And they didn’t force the needle to skip off of your vinyl either. Just ask Bob Clearmountain about it. So how many faces can the bass drum have? As many as you want, practically. Feel free to experiment. Just make sure that every single beat of it is audible in the final mix, and you’ll be golden. ← Previous Previous post: Snare stuff – can you achieve these sounds?